Fastest XPS 13 thus far. The jump from ULV Kaby Lake to Kaby Lake-R is the biggest performance boost the XPS 13 series has seen in years. We investigate to see if this has had any repercussions in terms of fan noise, battery life, and temperature. Summa summarum så hade Dell bara upprätthållit den ganska låga standard som råder när det kommer till kamera och mikrofon så hade nya XPS 13 kammat hem en utmärkelse i Svenska laptopguiden. Om du däremot söker en välbyggd och kompetent ultrabook och inte lägger nog vikt vid funktioner så som kamera och mikrofon, då kan nya Dell XPS vara en bärbar dator för dig. Dell XPS 13 review: one of the world’s best systems is even better than before. The XPS 13 2018 proves to be one heck of a professional laptop capable of bringing out fast performance, quality entertainment, and long-lasting battery life. The camera placement may seem out of place and weird but we can live with it. We can see why Dell placed a Php99,999 price on the XPS 13 because it’s every bit of a premium thin and light. It definitely carries over the fame of the XPS series. The XPS 13 is the best all-round, small-form-factor Windows 10 laptop you can buy, but it isn’t quite perfect. The first thing you’ll notice is the screen. Dell calls it an InfinityEdge display, and its tiny bezels and 4K resolution mean it’s a very beautiful thing indeed. But it’s pretty tough too. Dell’s made it from a single block of aluminium with a carbon fibre palm rest, and if you go for the optional touch display that’s encased in Gorilla Glass. The XPS 13 was already a superb laptop. With a 4K screen, a new design and improved performance it’s superb-er. My biggest complaint with the redesigned XPS 13 is that Dell just didn’t do enough and instead mostly stuck with what it is comfortable with. It didn’t fix the webcam, it didn’t rethink what the XPS 13 should look and feel like, and it made some frustrating changes to the port selection when it didn’t necessarily have to. And then there’s the disappointing battery life to contend with. The Dell XPS 13 2018 goes on sale today, with prices starting at £1041/$1000. Stay tuned for our full new Dell XPS 13 review. Moving the webcam position, adding facial login and a four-mic array, giving Intel’s chips more headroom to perform even better and adding a 4K screen have all evolved the XPS into an even more formidable flagship laptop. In directly addressing the concerns of users, the Dell XPS 13 laptop is refined further than perhaps ever before. Despite the inevitable loss of SD and USB-A slots, the XPS 13 for 2018 is still looking like a no-brainer if you can afford it and are in the market for a premium Windows machine. Long gone are the days when only the MacBook would suffice in the boardroom and classroom alike. Regardless, in a true endorsement of our coveted Editor's Choice award, our own Managing Editor, Marco simply "loves" this Alpine White-clad beastie and would gladly make it his personal daily driver, if he had his choice of laptops on the market currently. That about says it all. Dell is already teed up nicely for CES 2018, knocking another one out of the park with its flagship XPS line-up. Dell XPS 13 (2018) initial review: The best new ultraportable to have? 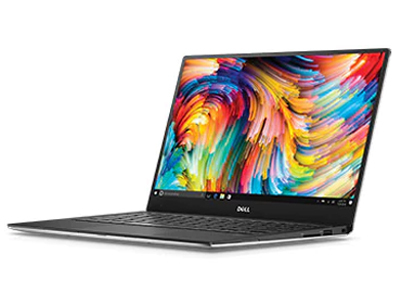 The new Dell XPS 13 is the company refining an already good laptop and ensuring that it remains a popular favourite with those on the move. CES 2018 : The Dell XPS 13 2018 (9370) Revealed! The Dell XPS 13 2018 (9370) ultra-light laptop introduces a new alpine white glass fibre weave material. This new material took a dedicated Dell team more than 11,500 hours and 50 trials to get right. It’s impossible to cover everything there is to know about this notebook, so we’d recommend hitting up the official website to learn everything you need to. For hardware basics, the XPS 13 includes a Core i5 as default, which can be updated to Core i7 (8550U). It’ll support up to 16GB of memory, a 1TB PCIe SSD, and for a super crisp image, it’ll also offer the option of a 4K resolution with 100% sRGB color coverage. Despite the performance improvements, Dell says its benchmark results have these XPS 13's running for up to nearly 20 hours with a full HD display or up to around 11 hours with a 4K display. Of course, actual battery life will more than likely be less, but we did break the 12-hour mark in our online video streaming test with the late 2017 version. With its excellent overall design (save for Webcam placement), solid build quality, long battery life, and significantly improved performance thanks to Intel's new four-core U-Series processor, there's a whole lot to like about Dell's latest XPS 13. At the same time, there are thinner and lighter laptops available. The 14-inch LG Gram, for instance, packs a slightly larger screen, while weighing more than half a pound less, and still delivering very good battery life. But the XPS 13 definitely feels more rigid than LG's Gram laptops, and we still think it balances weight, thickness, and overall build quality better than just about any consumer-focused clamshell. The XPS 13 deserves a place in laptop history for what it accomplished: making laptops smaller and more portable than ever before. But perhaps now it’s time for Dell to look to future and reinvent itself again. Despite the small changes under the hood, the new XPS 13 has some apparent advantages over the last generation and also some minor drawbacks. With increased performance and battery life, Dell's premium ultraportable XPS 13 remains easy to recommend. The Dell XPS 13 remains our favorite consumer laptop, thanks to its epic battery life, strong 8th Gen Core performance and attractive design. 1.305 kg: Bara mycket stora surfplattor väger så här mycket, men bland ultrabooks och mindre bärbara datorer är viktklassen vanlig. 87.43%: Det här är ett bra betyg och över genomsnittet. Mellan 10 och 15% av de bärbara datorerna får som regel bättre betyg.